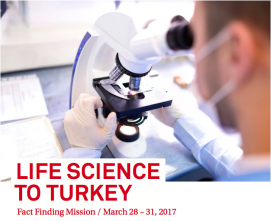 Switzerland Global Enterprise is organizing a fact finding mission to Turkey for Swiss companies who would like to know more about the opportunities in the Life Science sector in Turkey. On our Fact Finding Mission Life Science to Turkey, you will have the possibility to meet experts and representatives from the industry at networking events arranged according to your specific interests. Gain insights and enlarge your network! Turkey’s 80 million inhabitants have been growing accustomed to modern health care during the country’s rapid development over the last decade. Demand is going to rise even further in the next 20 years as the currently young population ages. The pharmaceutical market in Turkey is set to rise from billion in 2015 to .53 billion by 2020, representing a compound annual growth rate of 2%. According to IMS Health Report, Turkey is one of the top 20 “pharmerging” countries, having been ranked 19th in 2014, and expected to be ranked 17th in 2019. Turkey has become one of the most popular medical tourism destinations. The number of healthcare tourists visiting Turkey reached 746,000 and the revenue they brought in reached .8 billion in 2015. The term biotechnology first appeared in the programs of the Scientific and Technological Research Council of Turkey (TUBITAK) in 1982. Turkey has been researching and investing in biotechnology for almost four decades. Take the chance to participate in this unique business trip. We look forward to hosting you.